NEW DVD RELEASE BY DOUBLE VISION - 'IN VISION' available NOW. 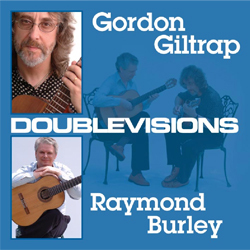 Double Vision - In Vision is a DVD that captures two specially filmed performances of Gordon Giltrap and Raymond Burley. Although both artists have completely different styles they manage to blend both styles together effortlessly in two intimate performances filmed in late 2006 at Stickford Church and Fulston Manor. Having already recorded an album together in 2004 entitled Double Vision, the next logical step was to film these two wonderful artists in concert and two specially arranged concerts were set up in late 2006. Both performances feature the two musicians bringing out the best in each other in this rare coupling. Orders are now being taken on the dedicated micro website. Gordon and Raymond recently spent a very pleasant day with their good friend Paul White at his studio in Malvern where they recorded two pieces: Kaz and Tears of Joy. Their Double Vision CD was released in 2006 by Voiceprint and is now re-released by the German company Hypertension with the title 'Double Vision - Special Edition'; the two new pieces will be included as bonus tracks. The recording has been re-mastered and has different artwork.